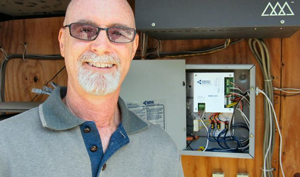 In the fall of 2011, Pastor Douglas L. Crook of Abundant Grace Fellowship in Wheat Ridge, CO contacted Brayden Automation about using a demand controller in conjunction with their recently installed Solar PV System. He had found BAC on the internet while searching for ways to avoid excessive demand charges. Their peak demand was previously over 25kW, meaning they were on the SG (Demand) Rate, thus paying a demand charge as well as a kWh charge even though they were actually producing more energy with their solar system than they were using from the utility. They had been manually controlling their load, but Pastor Doug was concerned they would exceed the 25kW threshold at some point. By using an Energy Sentry 9388B demand controller to manage their 2 air conditioning units, and other suitable loads, they were able to stay below the 25kW threshold. Xcel Energy moved them back to the C rate which has reduced their electric bills dramatically. Now, when they “sell” their solar produced kWhs to the utility they receive a greater pay back due to the rate structure of being on the C vs. the SG rate. By eliminating their demand charge and “banking” their kWhs, they are able to off-set cloudy and overcast days as well as a large night time load when the Solar PV System is unable to produce enough kWhs to provide power for their electric load. They don’t have to worry about a demand charge since the C Rate is kWh’s only. Abundant Grace Fellowship has reduced their electric bills by 90%! By using the 9388B combined with their solar system, their electric bills dropped from around $800 to $80 per month. Brayden Automation was contacted in the Fall of 2009 by Pastor Steve Elmore from Journey Church of Windsor, located in Windsor, CO. He was referred to us by the local utility, Poudre Valley REA, in hopes of lowering their electric bill by using demand management. After some research, President Bill Brayden found that they could save the most money by getting on the Energy Time-of-Use Rate. To drop to this rate, they would need to stay under 37.5kW every month. He found that 70-80% of their electric use occurred during the Off-Peak periods designated by this rate, meaning this was a great opportunity for them to save money. In addition to capitalizing on the Time-of-Use Rate, Journey Church of Windsor’s building is equipped with an ideal combination of controllable electric loads. They have 5 electric heat loads and 6 air condition units, two of which are 2-stage compressors. Having controllable electric loads for both heating and cooling is optimal because it allows for year-round control during all seasons. This increases the likelihood of staying under the 37.5kW threshold while continuing to maximize savings throughout the year. Journey Church of Windsor is now saving around $6,000 per year on their electric bills. On average they have cut their monthly bill by 44%, all by using a 9388B Energy Sentry commercial demand controller. The United Church of Christ is located in Simi Valley, California. In 2005 they were put into a more expensive rate bracket, forcing them to pay higher electric bills. Each year they tried to stay below 20kW but were unsuccessful. In 2009 Scott enlisted the help of Brayden Automation to resolve this problem. Based on their electric load needs, Bill Brayden, President of Brayden Automation, suggested an Energy Sentry 9312 demand management system to solve the problem. 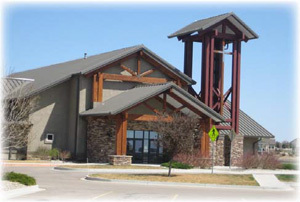 The Simi Valley Church is currently using the 9312 to control their heating and air conditioning (HVAC). With the 9312, the Simi Valley Church will save approximately $2,500 per year based on the utility company’s estimate. This is a significant percentage based on their average utility bills.